Pink eye can be a real problem over summer. Pink eye is caused by a number of “bugs” – viral and bacterial but the main bug is called Moraxella bovis. 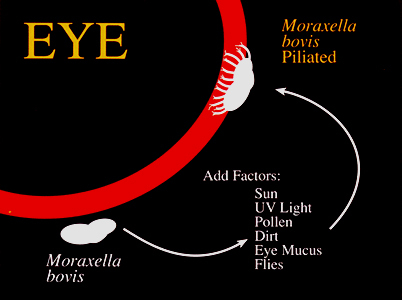 Moraxella bovis is carried in the nose and eye fluid from infected and carrier cattle. If the factors are correct, pink eye can spread. Flies – responsible for spread of the bacteria between animals. Ultraviolet light – sensitises and can damage the cornea. Long grass – causes physical damage and can cause mechanical transmission. Dust – irritates eyes, increases tear production and assists spread. Pigmentation – pinkeye is generally more common in non-pigmented eyes. More common in Bos taurus than Bos indicus cattle. Overcrowding (e.g. cattle congregating for drought feeding, yard weaning). Immune status - cattle in poor body condition tend to be less able to mount a protective immune response against the bacteria. Prior exposure leads to immunity, hence disease is more common in young stock. Adult stock are still susceptible if they have not been previously infected. Herd outbreaks were observed in Tasmania when the disease was first introduced. 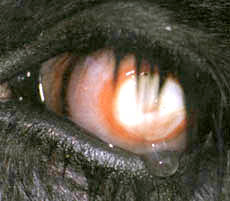 Increased tear production is often the first sign seen. 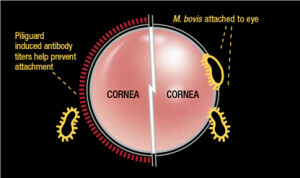 The cornea then becomes cloudy and a white spot can appear in the centre. Some cases clear at this stage but others progress to corneal ulceration and the cloudiness covers the whole cornea. The eye changes from a white to a pink to a yellow colour. Some of these eyes will return to normal following treatment, some will resolve with no treatment, some develop a small white scar and others are left permanently blind. Pili are hair like structures on the surface of many bacteria – they aid attachment of bacteria to the surface of the cornea. Vaccination reduces the incidence and severity of the disease, reducing individual animal suffering and production losses. Pinkeye is often well advanced before animals are treated and as such animals often don’t respond well to treatment. Vaccination reduces the need for antibiotics and therefore reduces the risk of bacterial resistance or residues. 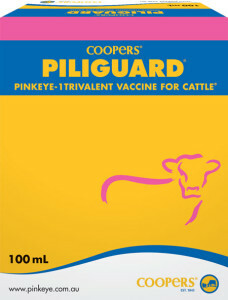 To be effective, the vaccine needs to be given 3 to 6 weeks before the “pink eye season”. The vaccine is a single, 2 ml injection under the skin Annual revaccination is recommended. Calves as young a 1 week can be vaccinated. There is no milk or meat withhold. The vaccine only claims to AID in the control of pink eye – it will not totally prevent it. There are different strains of the bug which causes pink eye and the vaccine contains 3 of the strains. 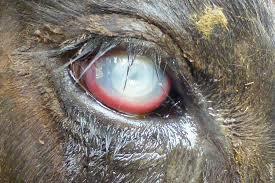 Research in Australia showed that in over 77% of pink eye outbreaks examined, the pink eye bug found in the cattle cross-reacted with the strains in the vaccine. In plainer english, in three quarters of the outbreaks examined, the vaccine would have helped make the outbreak less. You will need to examine how much pink eye you get, how much it costs you and decide if vaccination is worthwhile. BUT, remember, the vaccine must be given 3 to 6 weeks BEFORE the peak pink eye season. You can help prevent pink eye by limiting fly numbers with products such as Arrest, trying to choose paddocks which are not dusty or have long, dry grass. If animals do get Pink Eye prompt treatment with the correct ointment will prevent the severe damage to the cornea. If animals get severe Pink Eye, we can help limit the damage and animal suffering. Sometimes we will give injections into the tissue around the eye and sometimes we will sew the eyelids together for a short time to protect the eye and aid healing.